Located within the Empire Parlor at Winterthur is a unique pair of side chairs. With distinctive double-balloon backs, incurvate stiles, and elegant scimitar legs, these chairs stand out from other pieces in the room.1 They are constructed primarily of mahogany and represent the aspirations of a social class that used interior décor, and especially furniture, to denote status and wealth through novelty. Unlike other classically inspired chairs, many of which pay homage to the Greek klismos design, these two, with their voluptuous silhouettes and dramatic curves, reflect forms more typically associated with Biedermeier furniture of Central Europe. The front legs of the chairs are cut from solid mahogany while the rear legs, which become the stiles, combine solid wood and veneer construction. From the base of the leg to the seat rail, the rear legs are solid. Continuing up from the seat rail, however, the stiles are veneered, with the veneers extending beyond the stiles and onto the edge of the back, gracefully connecting these structural components. 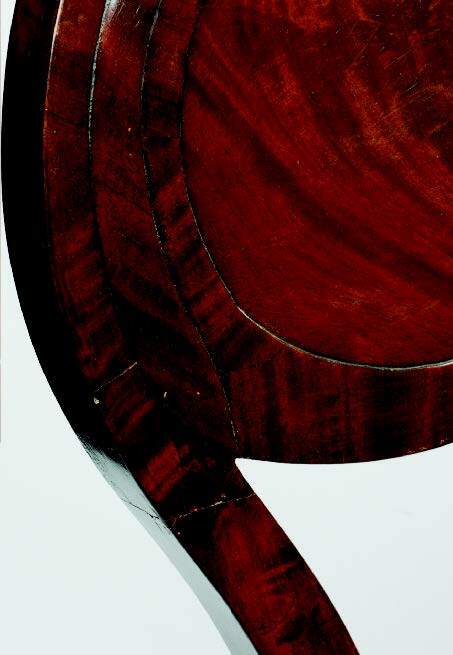 The front side of the seat back is veneered with a piece of crotch-grain mahogany that, laid horizontally, visually extends the double-balloon shape and heightens the geometric nature of the chair. Around the edge of the back, layered and shaped veneers frame the center panel and form an abstracted tripartite design.2 With the exception of the raised veneers, the backs of these chairs are mainly planar, relying on the rich figured wood for ornament, a device commonly found in Biedermeier furniture. Some Biedermeier designs harken back to the French taste and goût grec of the Napoleonic era, but others are fanciful and more playful. Winterthur’s chairs appear to be related to several found in European collections, including one constructed of walnut by Josef Nepomuk Geyer of Innsbruck, Austria, now in the collection of the Museum für Angewandte Kunst in Vienna (Museum of Applied Arts). Like the Winterthur chairs, the Geyer example features elegantly shaped stiles that flare into a double-balloon back, which, in this case, is open rather than solid, giving a light and delicate appearance to the chair. Layered veneers frame the outer edges of the back, drawing attention to the dramatic curves, not unlike the Winterthur examples. János Boros Nepomuk, Kastélyszoba (Castle Room), Hungary, 1842. In 1839 he sold the Bond Street town house to Abraham Schermerhorn, a politician, businessman, and partner in the shipping company of P. & A. Schermerhorn. Well-connected in New York City, Schermerhorn’s daughters married members of the city’s elite, with one becoming Mrs. William B. Astor. 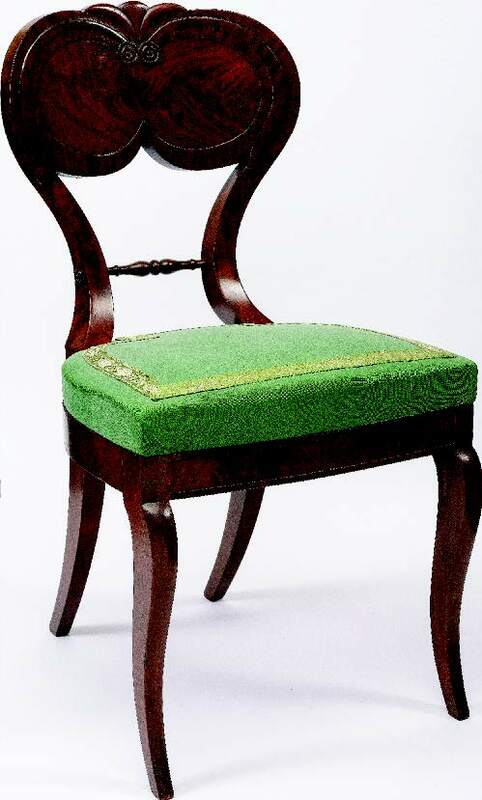 Ownership of these chairs by either family seems plausible, as they could have afforded furniture of this quality and were likely familiar with Biedermeier designs through their business connections in Europe. Early nineteenth-century New York was considered an architectural backwater, a connotation that changed with a series of construction projects in the 1820s and 1830s.With the growth of commerce and industry in lower Manhattan, wealthier residents began moving uptown toward Washington Square, Bleecker Street, and Bond Street, expressing their sophisticated aesthetic tastes in architecture through handsome town houses. James Silk Buckingham took note of these new dwellings while visiting from England in the late 1830s: “The interior of the principal houses may be described as spacious, handsome, and luxurious, with lofty passages, good staircases, large rooms, and costly and gorgeous furniture.”7 Such homes were ideal for entertaining and typically followed a double-parlor floor plan. 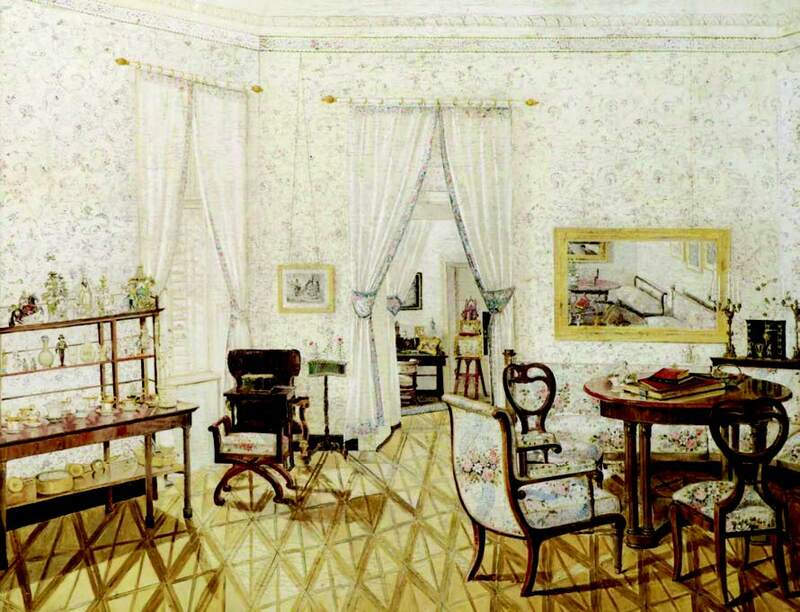 Frequently called drawing rooms, the parlors were often separated by pocket doors that, when opened, created a large room ideal for social functions. Hosts could also adapt the space by closing the doors and removing or inserting furniture in various configurations. With heavily abraded backs, Winterthur’s chairs appear to have been moved frequently and were likely placed against walls when not in use. As purchased by Henry Francis du Pont, these two chairs were part of a set of six, and one can only hypothesize as to how the set may have functioned in its original context. Six chairs would likely be too few for use at a dining table, though one cannot be certain that the six purchased by du Pont were not once part of a larger set. It seems probable that the Winterthur chairs were intended for a parlor setting, where they would be well-suited for tea and socializing. Whether constructed in Europe or America, these two chairs are particularly striking examples of nineteenth-century domestic furniture representing a preference for fashion and novelty in interior design. Their Biedermeier design illustrates the austere refinement and worldly taste of their owners and highlights the diverse decorative tastes of an American consumer market. 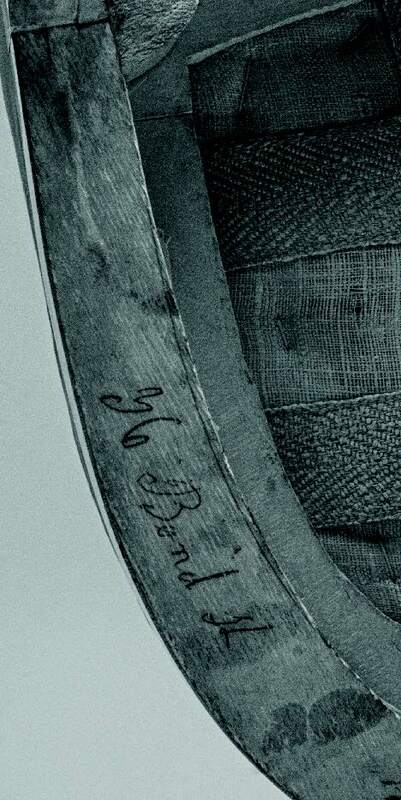 Post by Willie Granston is a Lois F. McNeil Fellow in the Winterthur Program in American Material Culture. destroyed by unsympathetic repairs. On the tripartite design, see Angus Wilkie, Biedermeier (New York: Abbeville, 2006). a Biedermeier design motif that has been inadvertently ascribed to a specific printed source. l’Époque Biedermeier (Paris: Atelier Philippe Gentil, 1990), 54, 31. (Master’s thesis, University of Delaware, 1986), 80.
corner blocks, scientific investigation cannot shed light on the origin of these chairs. in Connecticut, where Schermerhorn died and was buried in 1855. One must wonder why the chairs left New York. Were their shapes considered too passé or were they simply family favorites taken to Connecticut? British Travellers (New York: Henry Holt, 1923), 310. This entry was posted in Academic Programs, biedermeier, Decorative Arts, Delaware Antiques Show, Design, Du Pont Family, Furniture, House, museum collection, Students & Alumni, Uncategorized and tagged antique furniture, biedermeier chairs, furniture collection, Winterthur, Winterthur Museum Garden & Library, Winterthur Program in American Material Culture. Bookmark the permalink.